Oh, and don't mind the notes indicating needed adjustments. 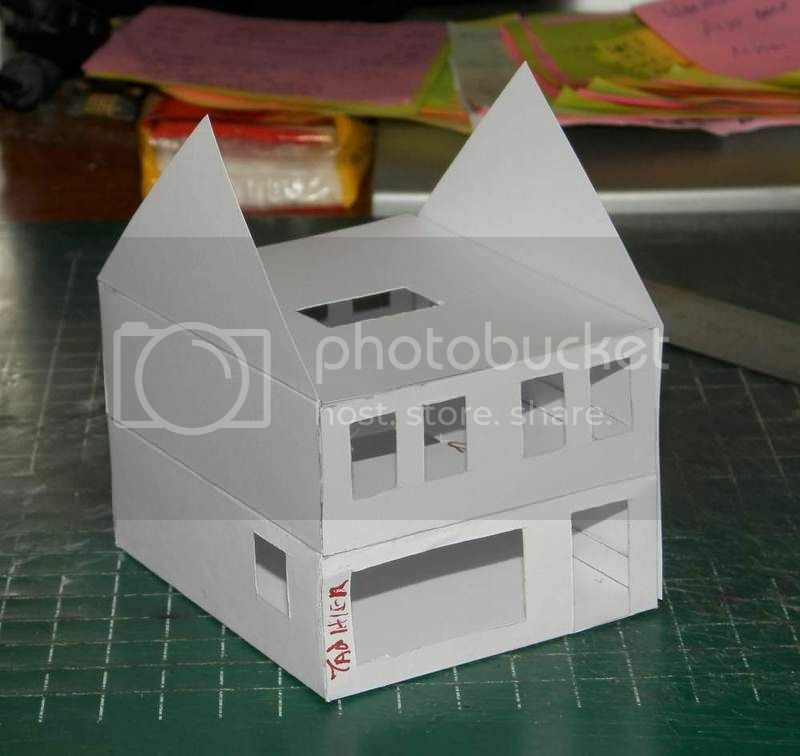 That's the handy thing about paper modeling - it's its own note paper. 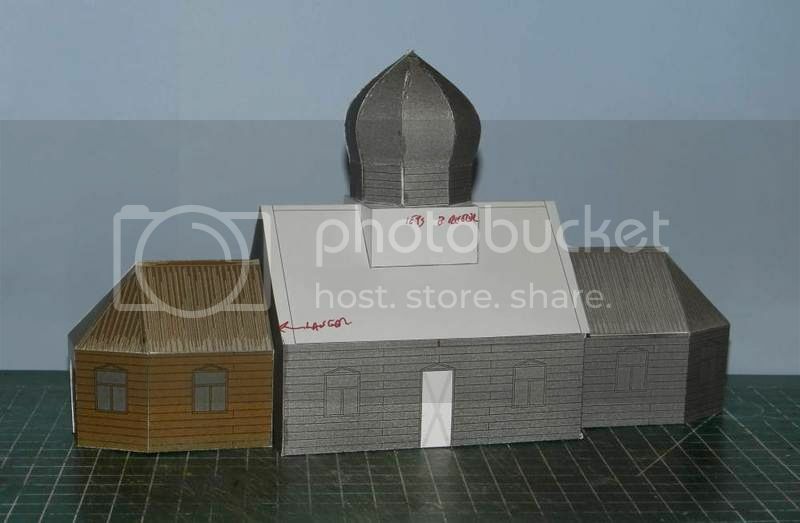 I asked the printer to do a test print of the wing, to see if the weathering of the church looked alright - we must after all assume the local kommissar would not allocate materials or manpower for the upkeep of a religious building. I'm not totally unhappy with the weathering effect on the roof, but now a new task presents itself: the walls now look to clean, so at least some weathering will have to be applied there as well. You comments will be appreciated, as welcome. 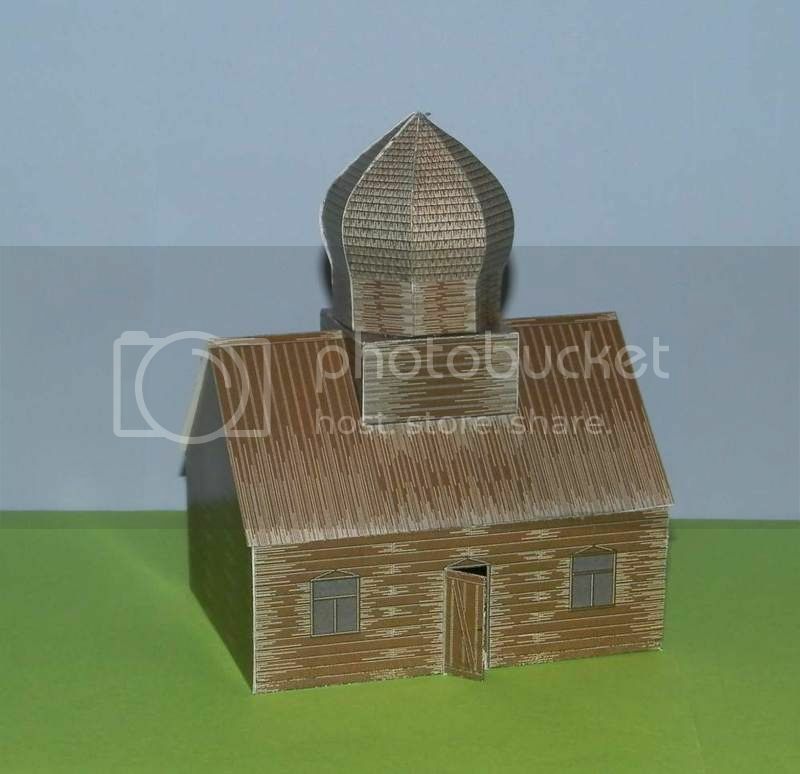 I needed a break from colouring and weathering hundreds of planks and shingles for the Russian church, and it had to be something enough to e able to do after a largish dose of advocaat. 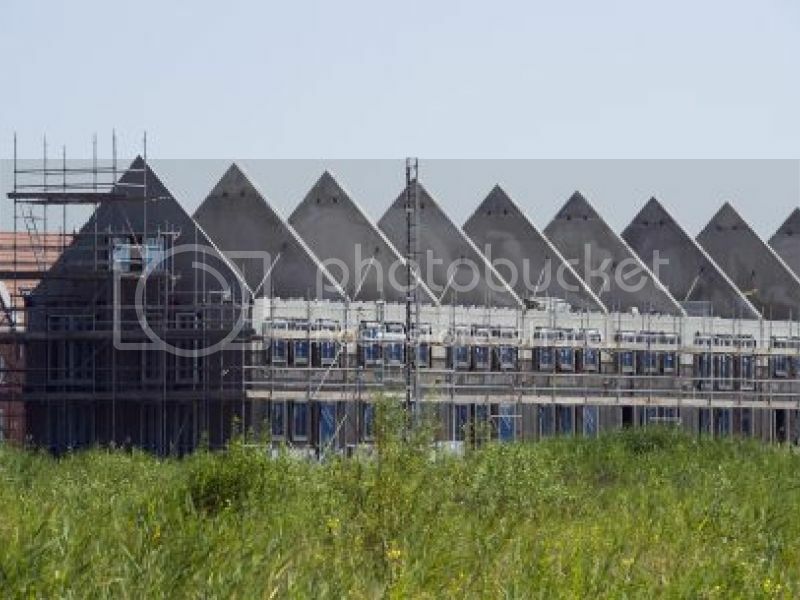 So I did some wurruk on modern Dutch houses under construction. The idea came to me at IKEA last Thursday, the top floor restaurant has a nice view of the city of Groningen, including of some blocks under construction. I ordered some grey paper so the window and other openings don't show white reverse sides of the walls, but that's on back order till next year, so a white paper test had to do for now. 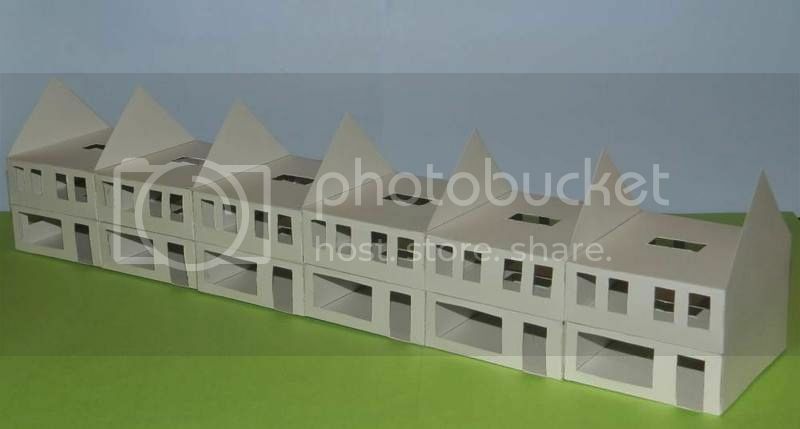 In the final version there will even be a terraced row of six houses. Except for some small details that will still require some attention, I'm quite happy with these results. Both Summer and Winter versions of the Russian church are done and sent to the printer's, so I did manage to finish them this year after all. Won't be able to get them till next year for the final build, I guess. 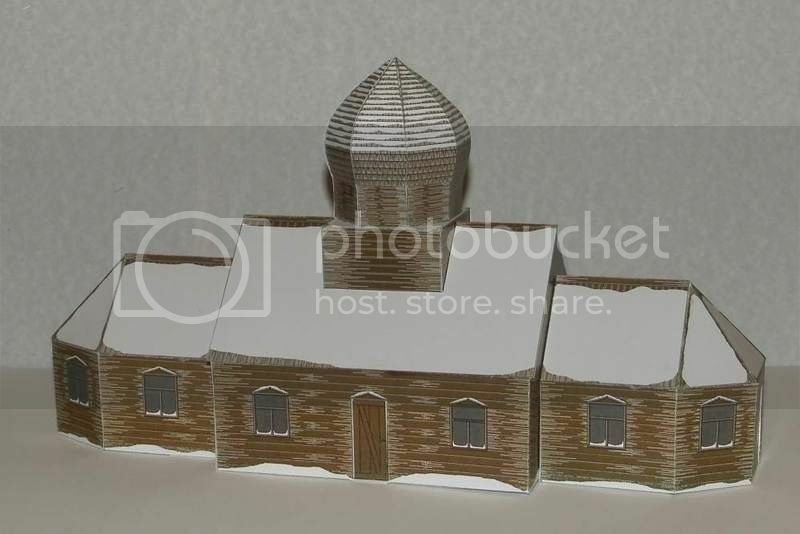 Anyhow, I said I wanted to finish this church this year, and I did, with half an hour to spare. The Winter version will have to wait till next year. Quite suitably, wet snow is being expected tomorrow. 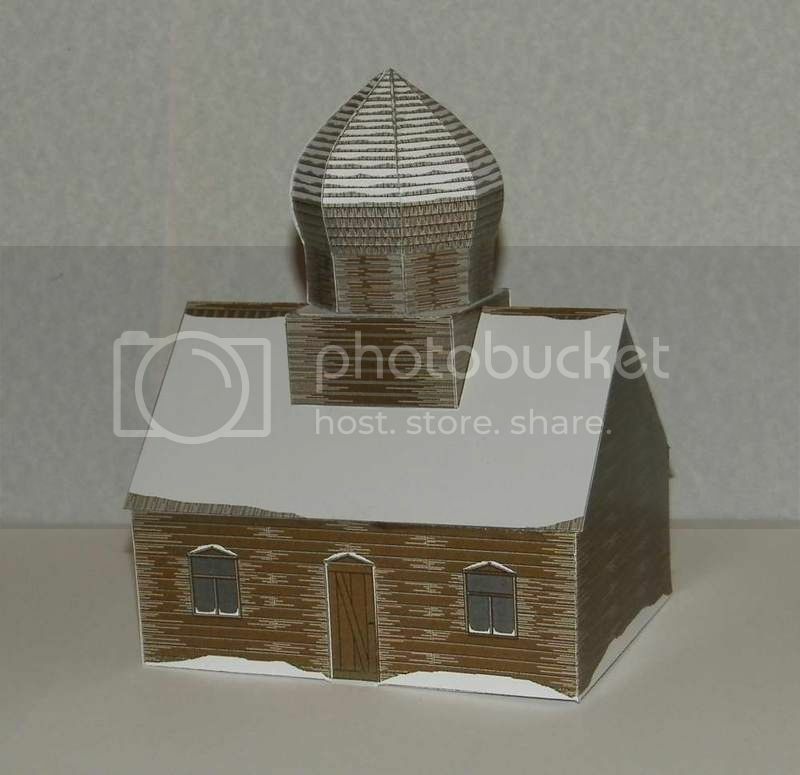 And finally the Winter version of the Russian church. The 1/72 versions will be available via our webshop www.papierenbouwplaten later this morning, other scales to follow soon(ish). I don't consider this a real project, just something in between. 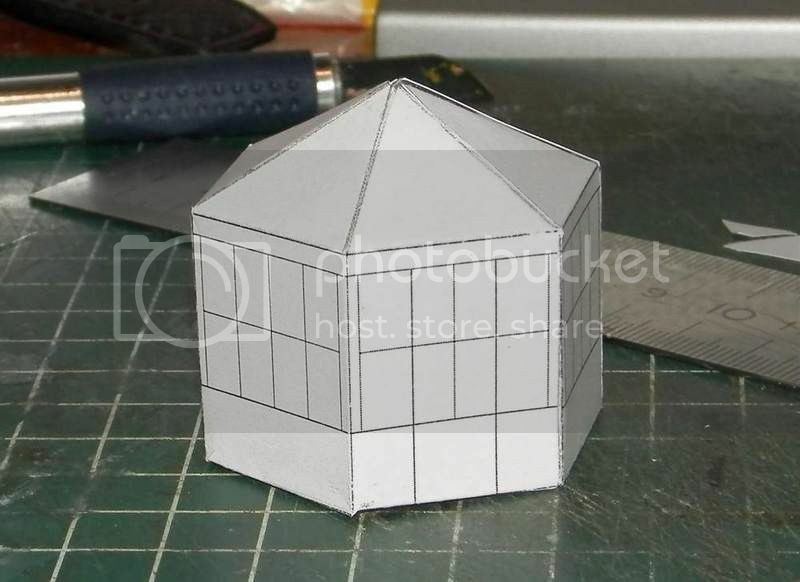 When it grows up it wants to be a gazebo. 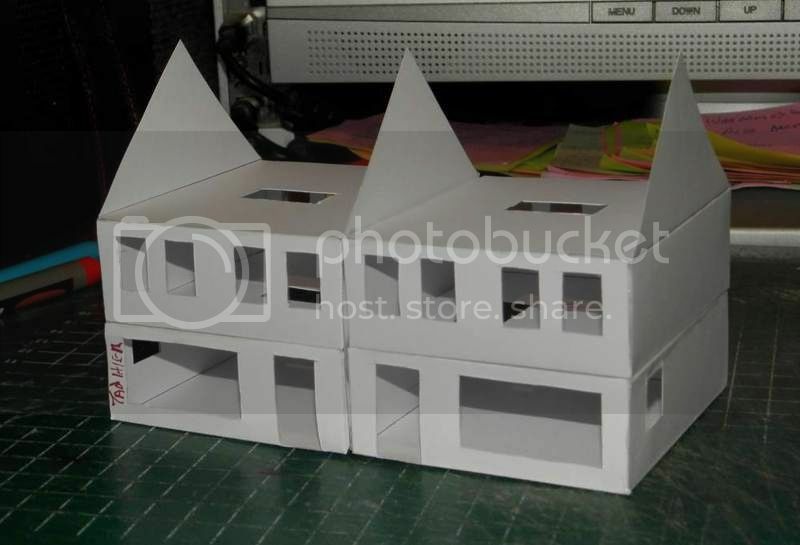 I plan doing it as a "hybrid" model: paper lower parts of walls, and roof, plastic sheet windows. 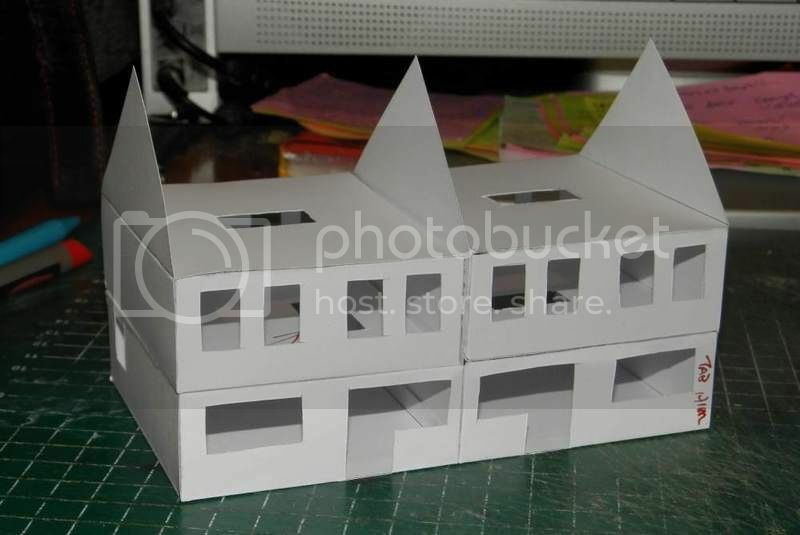 Grey paper came in, so I could finish the first of the buildings under construction, a detached house. 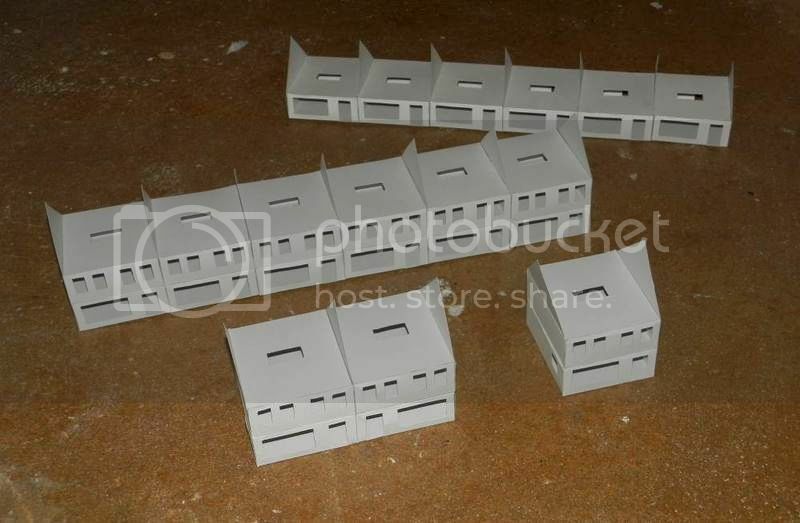 More structures using the same modules have been planned and will be tested soon. Using grey paper has the distinct advantage that you won't see any white interiors through the many openings. Is this also a common construction method in the UK? I know it's being done also in Germany, but then they have a long history with concrete. 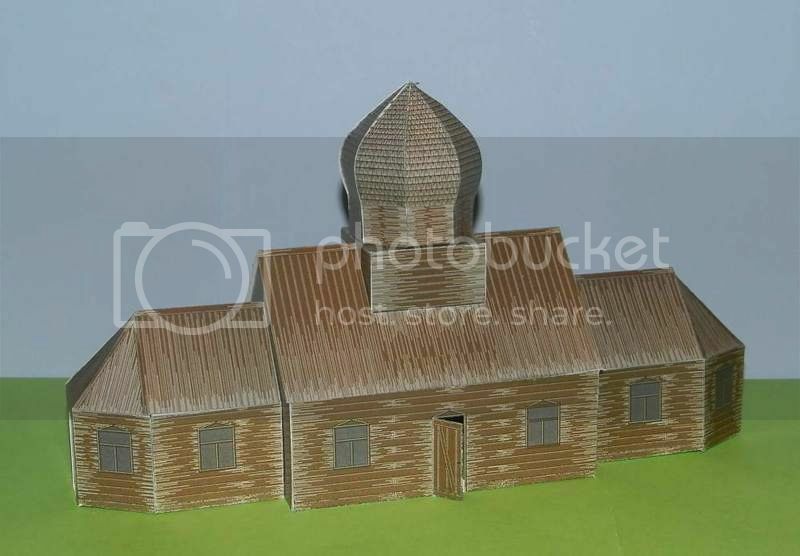 Speaking of which, I have been collecting bunker plans for a future project - but the future plans list is very, very long - and I just got a commission for a rather intricate windmill model. 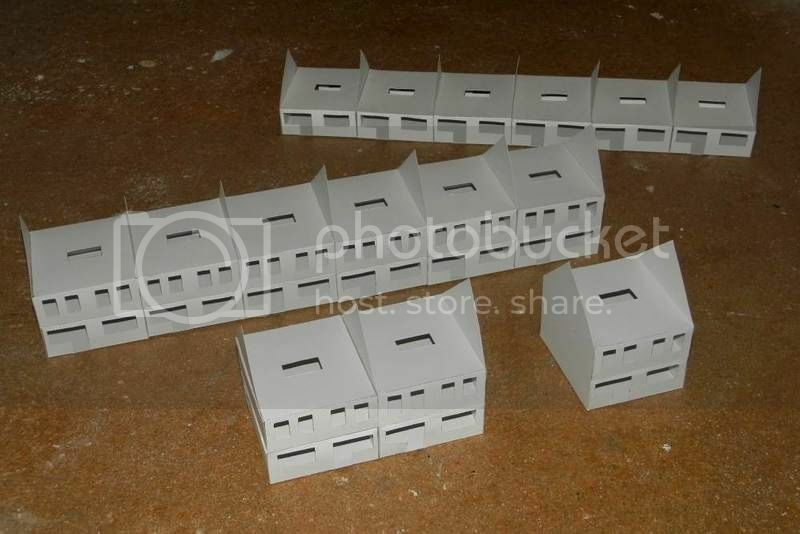 These are not pre-fabricated, they're mold-cast on the spot. Naturally, the molds are massive - I know, because a distant cousin of mine managed to catch one falling from a sixth floor. It kinda permanently excused him from work. Row of single story houses. Houses this size would be either senior housings or starters' homes over here. The reverse is slightly different, like on the whole series, to provide some variety. 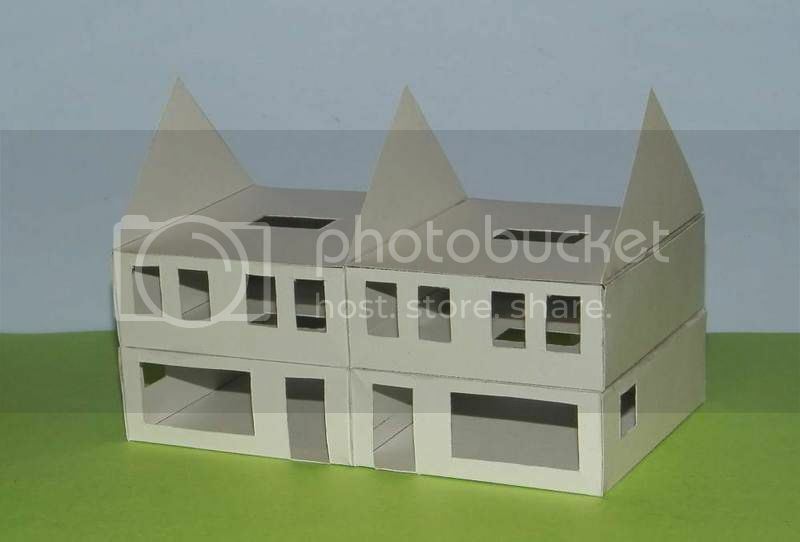 Last of this set is a row of six two story houses, to follow soonish. Gungnir Terrace #1-5 done, #7-11 to follow tomorrow. I'm thinking of adding some apartment buildings eventually. With a bit of luck, large doses of coffee will cure me in time. Had to get something out of my system - in this case a wooden railroad station suitable for the US and/or Canada. I used elements from several surviving ones to design this generic one, suitable for all periods from the second half of the 19th Century till present. Besides for model railroading I can see a games use for Wild West and gangsters/roarin 20s. 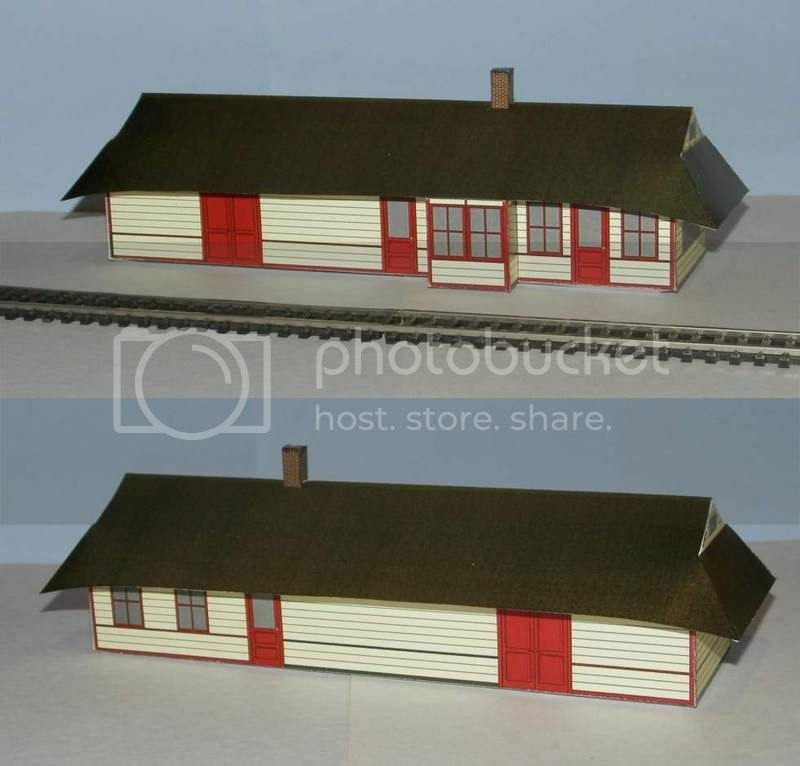 This is a test build, still needs some tweeking, mainly the station master's office (the sticking out bit) and the end parts of the roof. 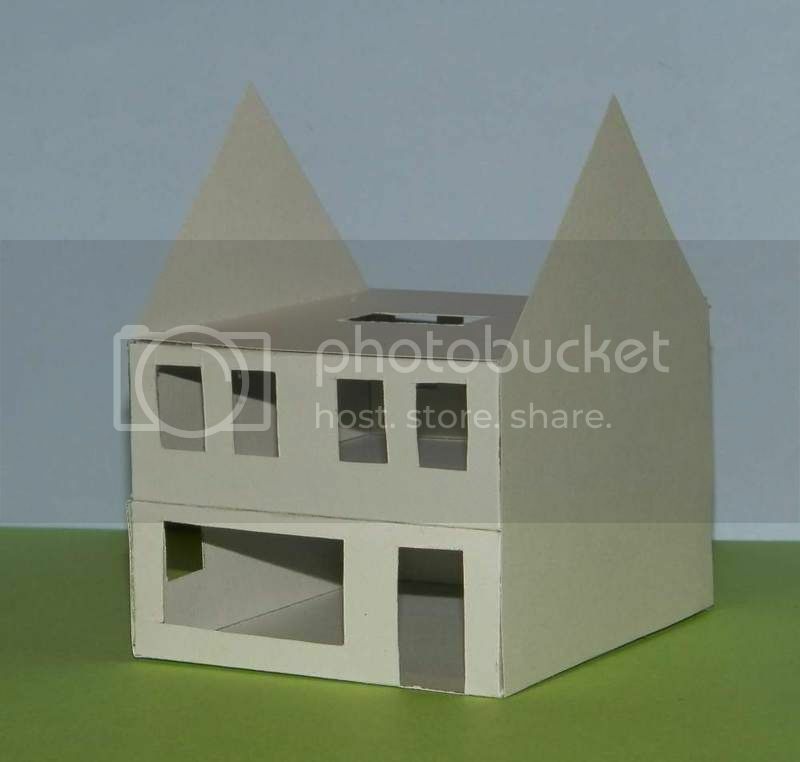 Then naturally the details, more planks, and I think a shingled roof. A chimney would be nice too. Forgot to say, plan to issue it in two colour schemes. Finished both versions and sent them to the printer's. 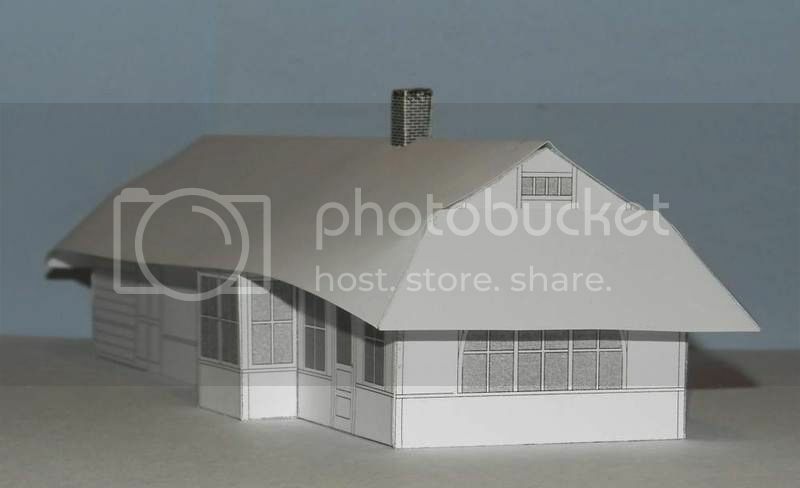 Finished my latest paper model last night, a wooden US railroad depot, in a style suitable for all settings from the mid-1800's till present day. As you can see there's a choice of two liveries: green, and beige with a red trim. 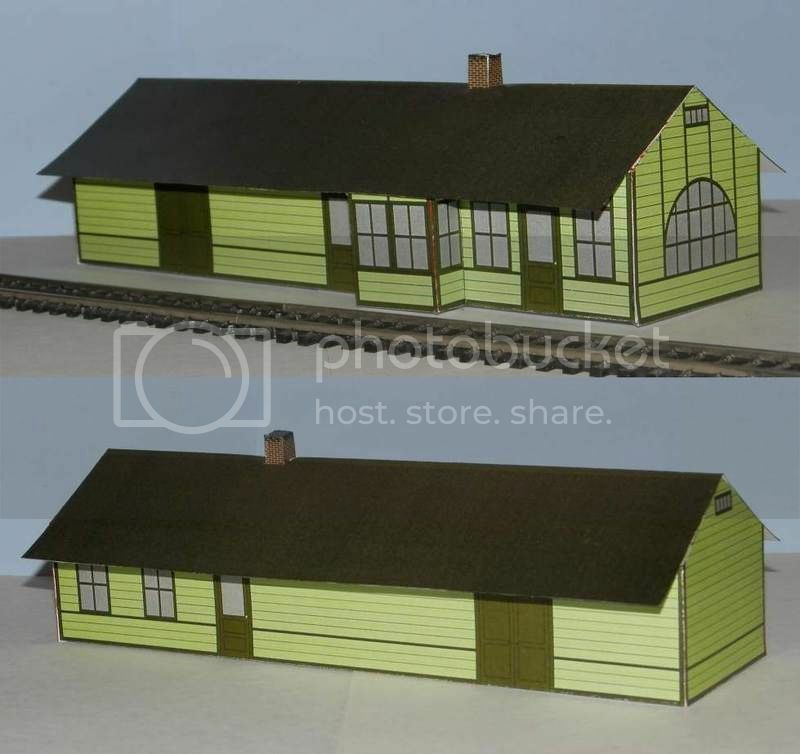 The roof may be fashioned in either of the two ways shown: with a curved overhang, or straight, giving a good view of the waiting room panorama window. 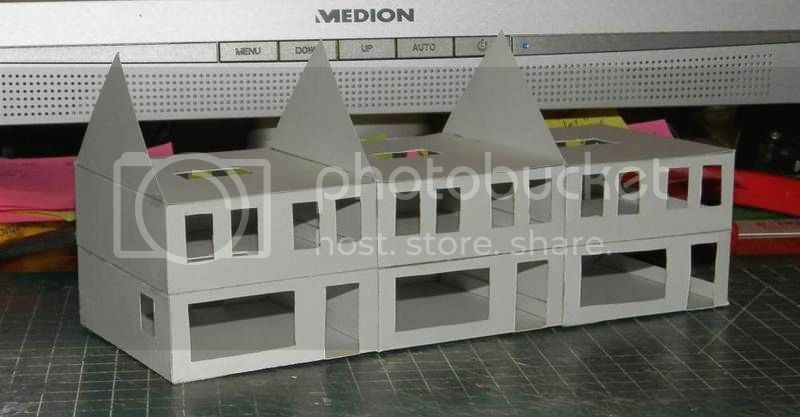 It will be available via our webshop www.papierenbouwplaten.nl in the usual model railroad and wargaming scales.